Lamborghini Huracan Review 2019 | What Car? The Lamborghini Huracán is a two-seater supercar powered by a mid-mounted, 5.2-litre V10 engine. The LP610-4 is the default, and most popular, version in the limited range. It sends a mighty 602bhp to all four wheels via a seven-speed dual-clutch automatic gearbox. 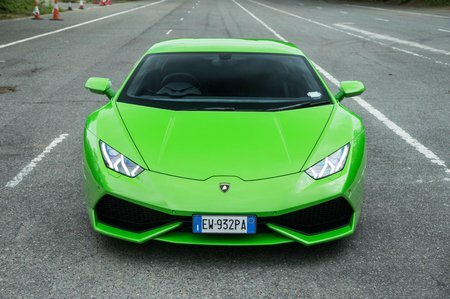 As well as this four-wheel-drive monster, there's also a 573bhp, rear-wheel-drive version of the Huracán, badged LP580-2, which is lighter and designed to offer a rawer driving experience. Finally, right at the top of the range, there's the Performante: it packs a mighty 631bhp and has numerous lightweight parts to make it accelerate faster and hang on better through corners. Key rivals include the Ferrari 488 GTB and McLaren 720S, against which the Lamborghini is competitively priced. However, the Audi R8 does make the Huracán look expensive, since both cars use the same basic underpinnings and V10 engine. So, how does the Huracán compare with its peers? And which version makes the most sense? Read on over the next few pages to find out.